Hawaiian Airlines was followed by Alaskan Airlines, Delta Airlines and Virgin Airlines – all of whom did really well in the report by keeping their on time levels above 80%. 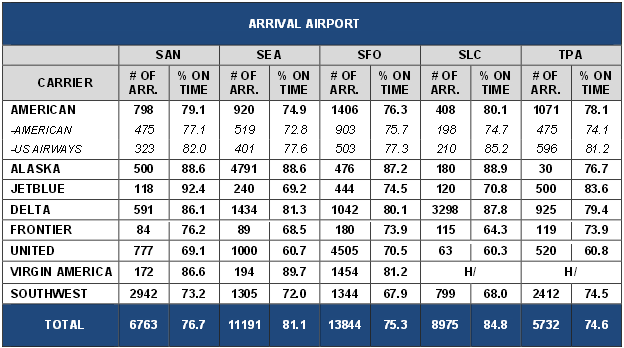 But Spirit Airlines did not fare so well in the report with just under half (49.9%) of their flights arriving on time. 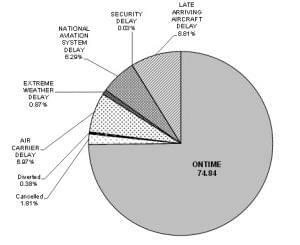 When it came to determining what on time meant when traveling the U.S Department of Transportation determined that a good benchmark would be if the flight arrived within 15 minutes of their scheduled time in the airlines computerized reservations system. So where did your favorite airline fell into the mix? Here the rankings for June 2015, starting with the airlines with the best on time flight ratio, and ending with the worst. Losing your luggage is definitely a headache, so the U.S Department of Transportation took at this area as well, by looking at how many complaints were filed by passages whose luggage was lost between January 2015- and June 2015. Here too some carriers did better than others. With Virgin American, Jet blue Airways, Delta Air Lines, Hawaiian Airlines having the least complaints, while the smaller carries like Sky West Airlines, Express jet Airlines and Envoy had the most.